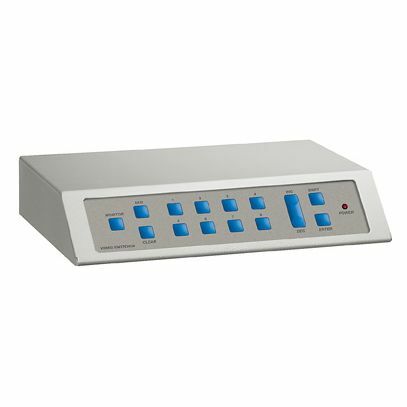 The SM82A microprocessor-controlled matrix with remote or local control allows the switching of 8 cameras on 2 video outputs. The matrix can be controlled by two remote keyboards or by the local keyboard. The keyboards, located at a maximum of 1200m (3937ft) from the matrix, allow the video switching and matrix OSD set-up, in four languages and telemetry control through the matrix itself. One alarm contact can be associated with the corresponding video input. In case of alarm, the alarmed video input can be displayed on the video output. The alarm contacts are independent and configured as normally open (NO) or normally closed (NC). The reset of an alarm situation is performed through keyboard, external contact or time-out. A programmable password ensures protection from improper use of the matrix. The telemetry control can be performed over the coax cable or by RS485. It is possible to control the video switching by a VCR trigger signal.